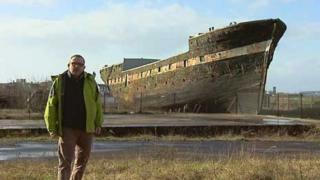 Final plans are being made to transport the world's oldest clipper ship to Australia from a yard in Ayrshire. The City of Adelaide, which was built in 1864, had been salvaged to the Scottish Maritime Museum at Irvine after sinking in the Clyde. However the museum could not afford to refurbish the vessel and had applied to demolish it. The Scottish government accepted a recommendation that the ship should be relocated to South Australia. Its journey should begin in early September. The City of Adelaide, or The Carrick as it was also known, was one of the fastest and most luxurious clippers sailing the seas, carrying migrants and other passengers to south Australia and bringing goods back. But after making 23 annual voyages to Adelaide it was redeployed to the North Atlantic timber trade. Later it was used as a hospital ship in Southampton, a sail training ship, and as a clubhouse moored in the Clyde in Glasgow, where it suffered flooding in the late 1980s. The vessel, which is older than the famous Cutty Sark, which is a major tourist attraction in London, has been on a slipway in Ayrshire since 1992 while a debate continued about its future. Trustees of the Scottish Maritime Museum struggled to raise cash to refurbish the vessel, and were on the point of scientifically deconstructing it so important features could be preserved in their collection. But the voluntary group Clipper Ship City of Adelaide Ltd (CSCOAL) submitted a tender for the job based on relocating it in one piece to form the centrepiece of a new maritime heritage park. Their proposal had won approval from a conference held in Glasgow that was organised by the Duke of Edinburgh. A number of firms from across the state of South Australia have contributed components for a steel cradle which has been assembled on the quayside at Irvine. The 450-tonne vessel will be raised and the cradle inserted under it, so it can be positioned on to a sea-going barge and moved to London. There it will be berthed close to the Cutty Sark, before being lifted into the hold of a huge cargo ship which will take it to Australia for the first time in more than 125 years. The ship is due to arrive by spring 2014. A rival group based in Sunderland, where the vessel was built, had hoped to provide a new home for the clipper. A campaigner from Sunderland has twice occupied the City of Adelaide to highlight its plight and to protest against the decision to send the ship to Australia. Dissident republicans are being blamed for killing 29-year-old Lyra McKee during rioting in the city.